Dr. Loftus offers extracapsular cruciate repair called the TightRope that offers the same benefits as the more costly TPLO surgery. Over 50 tightrope surgeries have been performed by Dr. Loftus since her certification 6 years ago. 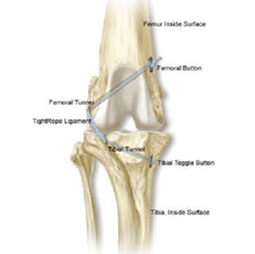 This surgery allows complete range of motion of the knee and less arthritis formation vs. the older lateral suture method. Tightrope CCL technique was developed to provide a minimally invasive method for ectracapsular stabilization of the cranial cruciate ligament-deficient canine knee. TightRope CCL seeks to optimize the lasteral suture stabilization technique by employing bone-to-bone fixation, an implant with superior strength and stiffness designed specifically for ligament repair, and a mehod for consistent isometric implant placement. As such, TightRope CCL can counteract cranial tibial thrust, drawer, and internal rotation, while providing optimal joint range of motion.